theaussieword.com goes one on one with one of the UK’s rising stars… RHODES! Welcome to theaussieword.com RHODES. It was back in 2013 where your music began to spread, started with a demo track you did for ‘Always’ which got picked up from BBC Radio, tell us about that. It was a crazy time because I’d gone from not singing or writing at all and I suppose hiding in the background playing bass for a band in London to having a bedroom demo picked up by radio 1. It was an amazing feeling and helped me a lot with my confidence in believing in myself as there was a lot of fears to overcome in singing and performing. Before you know it, you had quite a busy summer supporting Rufus Wainwright, Laura Marling and Nick Mulvey back in the UK with your debut EP ‘Raise Your Love’ getting released on Phil taggert’s label late 2013, was that a crazy time for you? Supporting Rufus, that must’ve been crazy!? It was unreal! I was writing and recording songs at home with no specific intention on anything ever coming of it. After Always was played on radio I began to wonder and dream of what it might be like if something real came of what I was doing. I did a show in London which became a sort of showcase to a load of industry type people and then after that things seem to go by in a whirlwind. My second show was supporting Rufus Wainwright, in hindsight I feel like being thrown in at the deep end was a good thing and taught me a hell of a lot very quickly. March and April 2014 were busy times for you RHODES, your first UK headline tour playing several sold out gigs across London. What was that like for you? Playing the live was the main obsicle to overcome and I still think to myself how crazy it is that people are paying to come and see me play my songs. My agent booked 3 shows in the same venue one night after the other in London at a venue called The Seabright Arms and I told him at the time he was mad and I wouldn’t even sell out one of them, so when all three sold out it was such an overwhelming feeling. It was such a busy time. Since then the shows have been getting bigger and bigger which is like a dream. You supported London Grammar and the legendary Sam Smith, one of the shows at the O2 Academy Brixton and on the road in Amsterdam and Paris, what was the reaction and buzz like performing in Europe? I love performing in Europe. I love road tripping through all of the different countries and getting the different feelings from place to place. Paris has been wonderful, I have family in France and my great grandpa was a chef in Paris. I like to be around other artists and see how they are and how they react to the shows and learn from them. I wouldn’t say I directly ask them for advice but just to be around it and surrounded by it is enough to learn from them. Glastonbury Festival was another notch under your belt, tell us what that was like? Glasto in the most iconic of British festivals so its always been one I wanted to go to… so when I got to play it, it was great. I did a small show on the rabbit hole stage last year and remember looking out to the park stage where James Blake had just finished his set. This year it was reversed, and as I played my set on the park stage, I looked out and across to the rabbit hole stage! It was amazing seeing and feeling that progression. It’s a wonderful festival. Its huge!!! 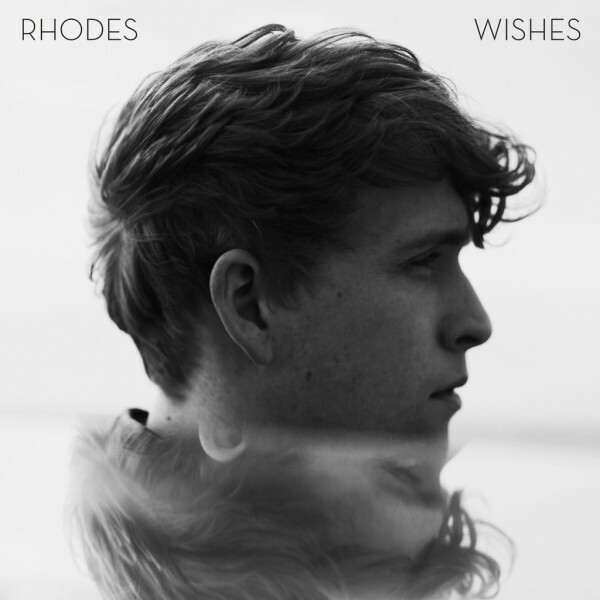 4 EP’s later you now have a new record out – ‘Wishes’ what was it like for you going from EP to album? The EP’s were full of experimentation and were very much a journey. I had so much to learn and wanted to learn it all for myself, I experimented with producers, sounds, instruments… it was good to have that time and space to make progress and it gave me a lot more clarity when it came to recording the album. There’s a great video ‘RHODES – The Making of Wishes’, an incredible short documentary. It’s really inspiring to watch, what was this time like for you as a recording artist and letting your fans see a true insight into your stunning new album? Thank you. I really wanted to outline the last two years and give an insight to what I see as the first chapter of this, RHODES as a project and as a journey that want everyone to be a part of. Its never been easy for me to be so open and frank about how I feel and what I write about so to be able to sum it up in the short documentary was an uplifting feeling. The new album is something special, two singles I adore are the fabulous ‘Close Your Eyes’ and ‘Let It All Go’ a special duet with Birdy who is quite phenomenal in her own right, what it was like recording with Birdy and filming the music video? It was great! I hadn’t written songs with anyone else for the album and hadn’t collaborated in that way before. Shes such an incredible singer and when we first met up it all just clicked in to place very quickly. We had the song written within and afternoon. I was flattered that she wanted to work with me because obviously she is a hugely established artist. Both of those singles have such powerful lyrics and spin-chilling vocals, what was going through your mind when penning those songs? Where did you draw your inspiration from? I draw my inspiration from memories, I think its important to hold on to memories and try to be able to go back to exactly how you’re feeling in certain situations. If you can remember and relate to the past then it allows to appreciate the future. I also write about relationships, not just romance but friendships and family. I write about overcoming fears and being strong and about how you can get from one place to another. Wow, that’s so wonderful to hear. You’re playing in-front of more massive audiences across Australia supporting Hozier, what’s your take on the Aussie crowd so far? The Aussie crowd has been incredible so far!! I feel very lucky to have been welcomed so supportively and everyone seems to be full of love here which has made the whole experience so absolutely enjoyable. I’ve met some great, great people on this trip. Looking ahead to 2016 and beyond what direction is RHODES taking next? Will we expect more of the same sound from you? Ive been writing a lot recently! I always write on piano or guitar so I think that will always be the centre point of my sopngs but I feel there is so much scope around theses intruments to experiment. I ‘d love to get more in to string arrangements. I’m 100% excited to start recording new music now. Congratulations on your latest record ‘Wishes’, what last message do you have for your Australian fans? I’d love to say thank you for being so welcoming and awesome on this trip! Autralia is a beautiful place and I cant wait to come back and play for you all again! In the meantime, enjoy Wishes and I’ll see you all soon.